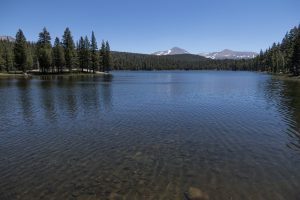 This small wooded lake is a popular destination to cool off during the summer heat. The trail steeply switchbacks up through a lodgepole forest. Continue past the junction with the Lembert Dome spur trail where it passes the ridge and gently descends to the Young Lakes Trail. Take a right through more trees and then onto the Dog Lake spur trail to the foot of the beautiful, wooded lake backdropped by Dana Peak and Mt. Gibbs. You can follow the trail along the south shore to the head of the lake. Visit Lembert Dome for an additional 1mi/1.6km (see Lembert Dome).